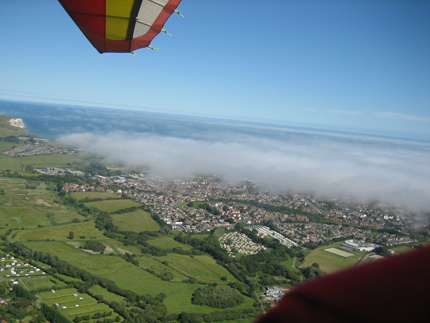 We arrived at Sandown on the Isle Of Wight around 1520hrs on 24th June after a 2 hour flight along the south coast. The weather had been quite windy and we’d caught the edge of a few showers en route. Hugging the coastline we could see that conditions inland we’re far worse, however as we neared the island things we’re improving, apart from the wind. It was definitely gusty and strong and called for a powered landing and rapid tying down of the wing. G-BYFF and Juliet Tango we’re already there and we made plans for staying the night. 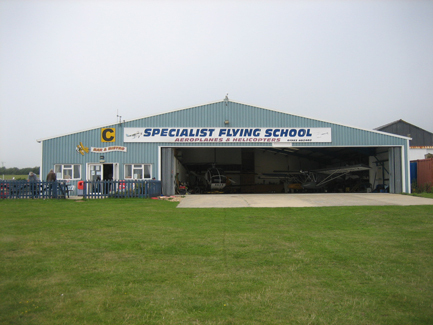 Many thanks go to John of Specialist Flying School who allowed BYFF and CBLX into his brand new hangar for the night. Alan and Mark kipped in the hangar but Elly and I we’re treated to a room he lets to course students normally. Aaah hot shower and a bed But first we all wandered down into Sandown and found an excellent sea front pub for some food. It was also the week of the “Island Games” which meant town was brimming with teams from islands all around the globe. 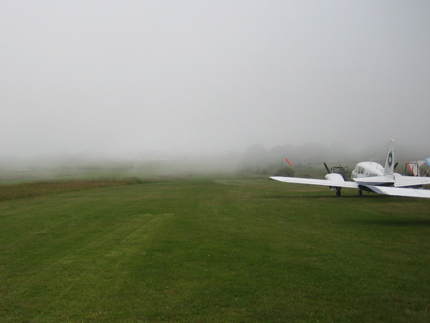 … visibility challenged shall we say. That is the view towards the runway. So, Elly and I enjoyed a day on the pier and had lunch with Mike and his co-pilot ? Mike needed to get home so was watching weather all day and finally got a brief window and escaped late afternoon. Next morning the weather reports were looking better but it still started foggy. 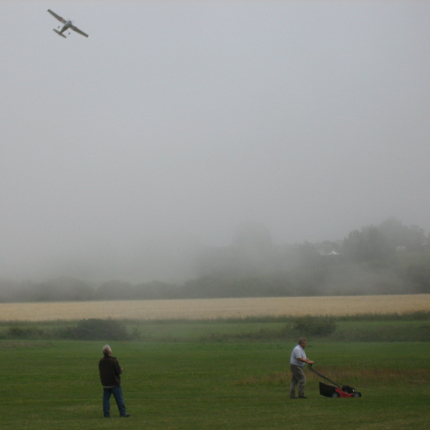 The only thing flying was a model plane! John did some essential airfield maintenance and mowed a classic, model sized, 3 runway airfield into the taxiway with his mower ! 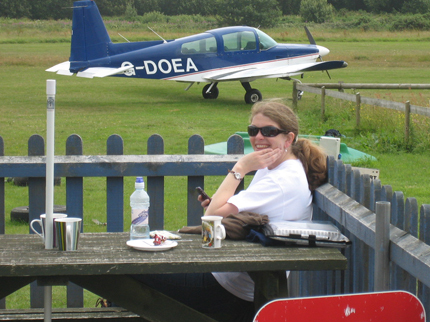 so we sat and enjoyed the sun as it finally started breaking through, eat copious amounts of food provided by the excellent airfield cafe and chatted flying ! 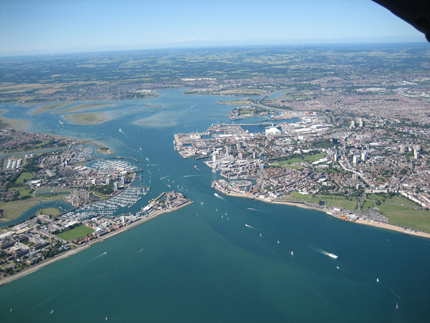 Finally, having heard radio reports from aircraft overhead saying it was bright clear and sunny a couple of miles down the island and over the mainland we started making plans to get away. First off was G-BYFF disappearing briefly into the haze climbing towards a thinning ever bluer patch reporting it was only about a 100feet thick and you popped into clear air. Half an hour later and it was burnt off and so Elly and I bid farewell and departed Sandown at 1610hrs. The sea fog was very localised ! 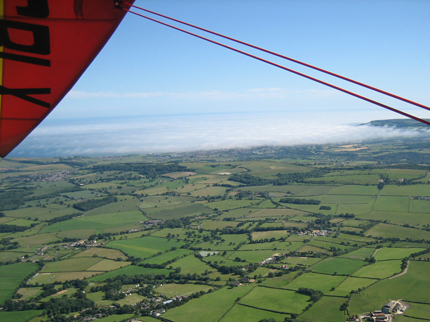 It was a great sunny flight home which took 1hr 50 minutes landing at Kemble at 1800 hours.